I've been a lazy bum when it comes to making dinner lately. The less amount of work, the better. Luckily, I've found this amazing box mix called Marion's Kitchen. 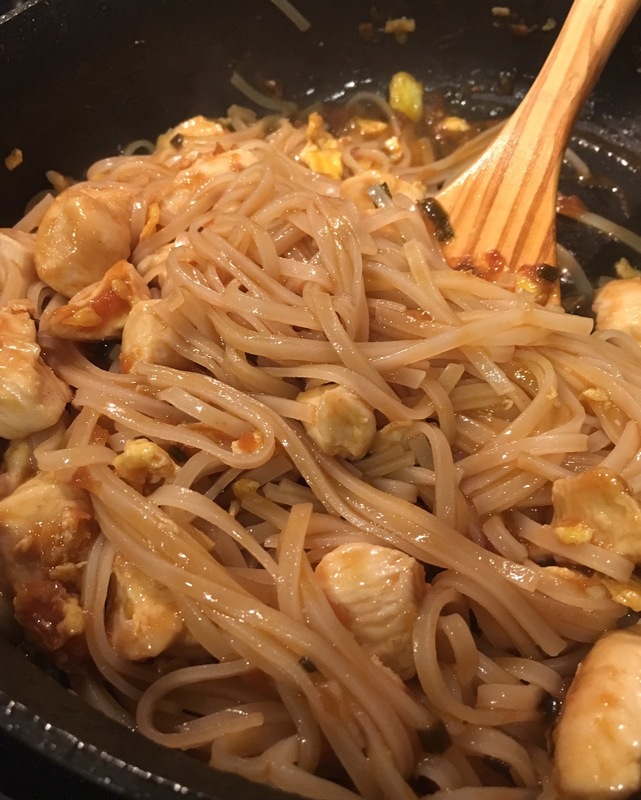 They are Asian meal kits that use clean ingredients. And I love them! First off, this isn't a sponsored post. I'm not even an affiliate, I just love this product so much that I want to share it with you! We've made three separate meals now - Kung Pao, Korma Curry and Butter Chicken. Each one has been really easy to make and the flavors have been amazing. Aaron's been eating them without adding extra sauce which is HUGE for him! That's saying something when he's not adding extra flavor. This week, we made the Pad Thai. I had some chicken breast that I had cut up and frozen last week, so we used that for our meat. The kit comes with everything you need to make your meal except for the meat and anything fresh you might need. 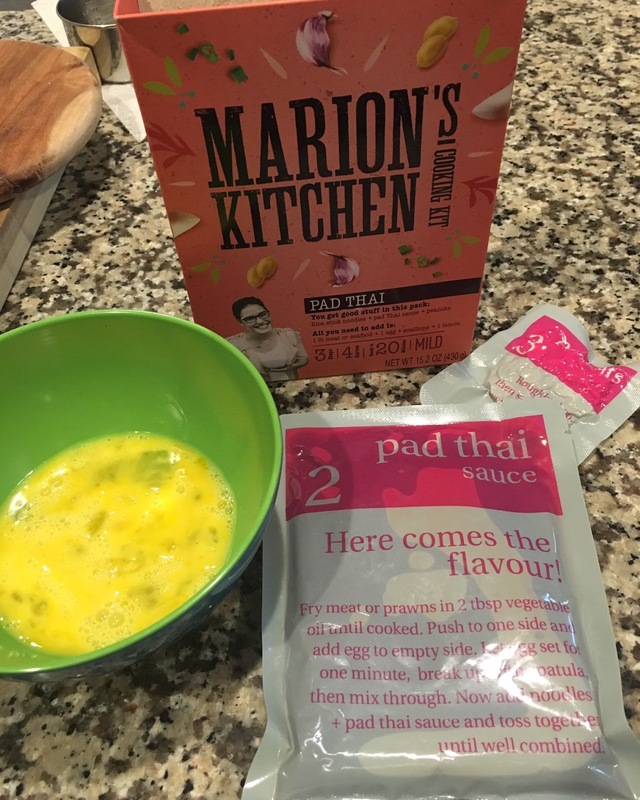 The pad thai meal needed an egg, so we also provided that. Everything else came in the kit. The kit has three packages. There are instructions both on the box and on each of the packages. They are numbered in the order that you use them. It's pretty much idiot-proof. I had already used pack one when I took the photo above, it had the rice noodles. 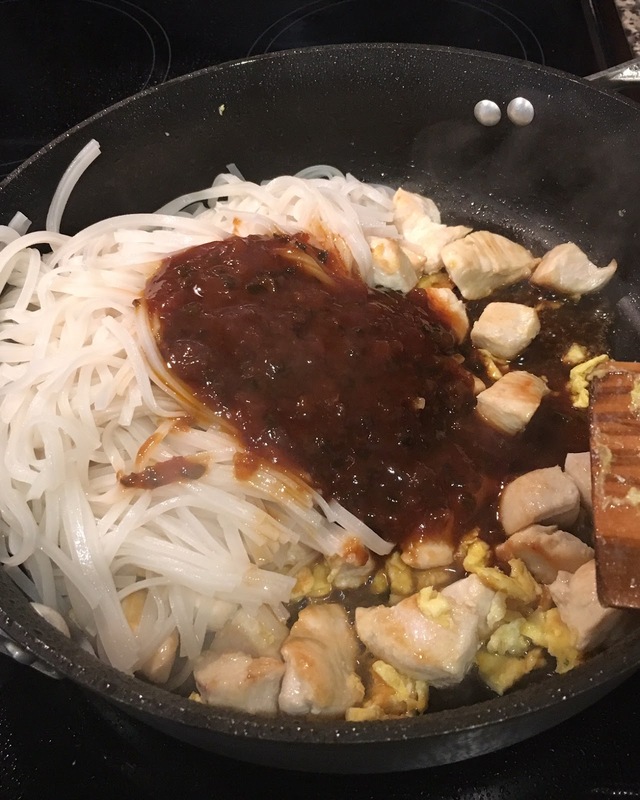 Once we made the rice noodles, then the recipe called for browning the chicken. 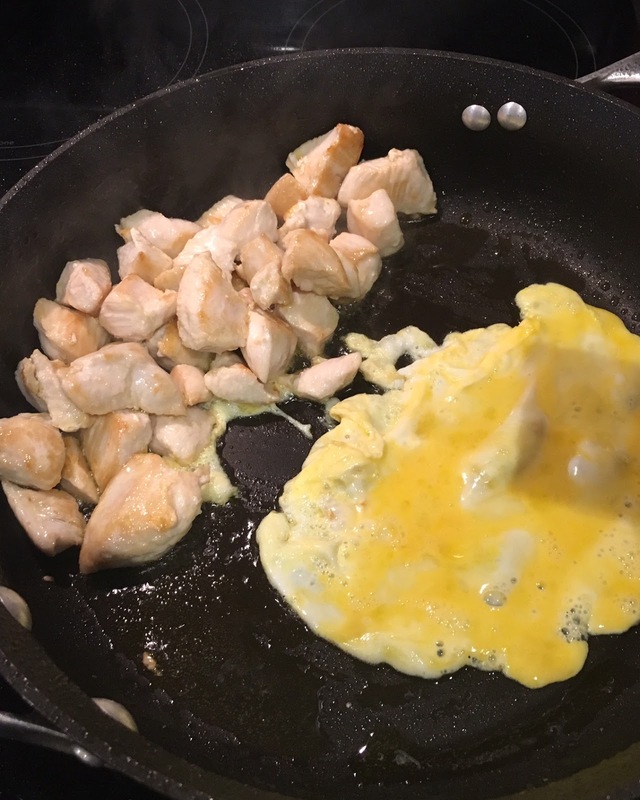 After the chicken was browned, I was instructed to move the chicken to the side and add the egg to fry it. I know to do that from making fried rice and other dishes, but those helpful tips are part of the reason I love these kits! 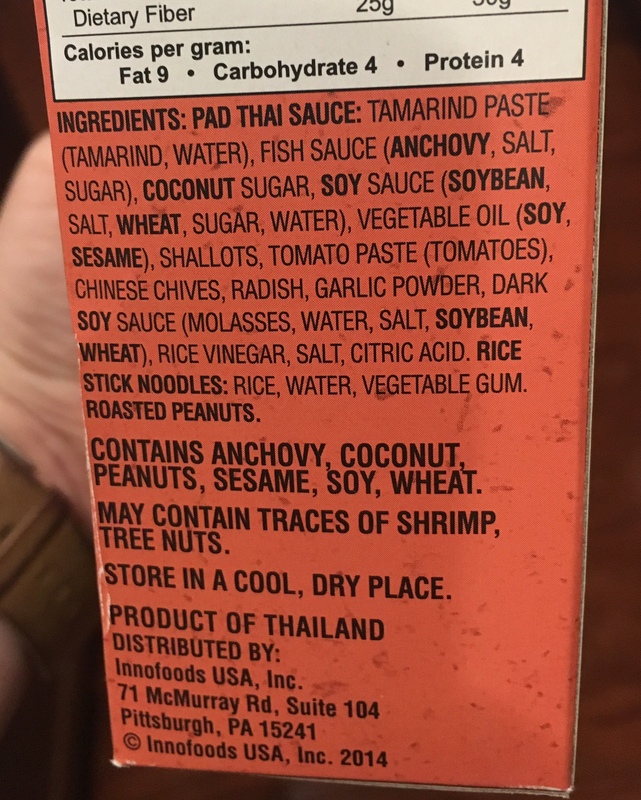 Then I just added the noodles and the contents of pack 2, which was the sauce. For the third pack, I just chopped the peanuts. This meal was seriously ready in about 20 minutes. I told Aaron that it would take about 30 and I was pleasantly surprised how quickly it all came together! Every single one of them is something I recognize. There aren't any crazy chemicals or things you can't pronounce, but actual food as the ingredients. 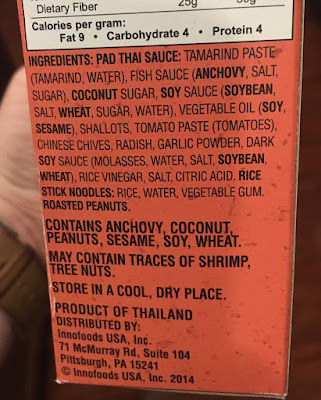 After Whole 30, I pay a lot more attention to the ingredients list and am always shocked at what is in packaged products. I love that these mixes have good, clean ingredients and that I actually know what they all are! I've mostly found these at Harris Teeter and Kroger. They tend to be a little more expensive, about $10 each, but they make four solid servings. We get dinner and leftovers for lunch the next day out of these meals, so for me, it's worth it. If you love Asian food and you like a good, quick, clean meal, definitely check these out! They've become a staple in our pantry!